Option credit spread volatility can be described by its Implied Volatility (IV) and/or its Delta value. Volatility is a very important element of the highly objective “The Monthly Income Machine” (MIM) decision process for identifying credit spread opportunities that offer conservative income investors high reward-to-risk trade candidates. One way to think about option credit spreads and Iron Condors is to look at the spread(s) as a bet on the probability that a stock or ETF or Index underlying will not arrive at the finish line (the last trading day before option expiration day) with the spread’s strike prices at- or in-the-money. Volatility greatly influences the likelihood of success for the spread. Consequently, the screening process for credit spreads must include a requirement that sets an acceptable limit for current volatility. For MIM, the basic measure of volatility used for trade entry evaluation is Delta. We use the current value of delta (measuring the current % likelihood that the option will expire at or in-the-money) as one of our trade entry criteria in order to arrive at a current list of desirable “conforming” credit spread candidates. A credit spread/Iron Condor investor could also use Implied Volatility (IV) as an initial screening parameter or as an additional factor to help narrow down a preliminary list of currently attractive credit spread candidates. How meaningful are the concepts of Delta and Implied Volatility in dealing with option screening? The Black-Scholes model that develops these option measurement variables took home the 1997 Nobel Prize in Economic Sciences! 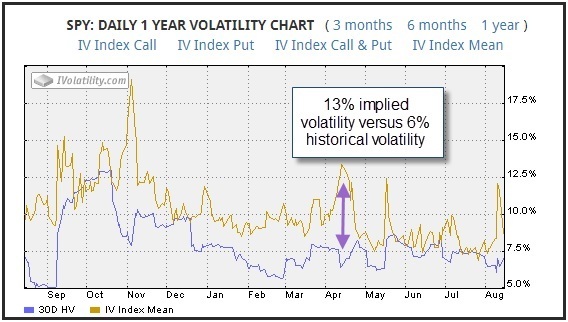 Implied Volatility may be thought of as a measure of how much an underlying security will move over a specific period of time, expressed as an annualized percentage. It is important for the credit spread income investor (or any investor employing any option strategy) to understand the impact of Implied Volatility on options. For option credit spreads, volatility is neither a “good” thing nor a “bad” thing. It is important in its own right, but even more so as one of the interdependent factors we must balance properly against other considerations in our search for the best-of-the-best credit spread and Iron Condor candidates. With credit spreads and Iron Condors we are searching for instances where the probability that a stock will reach the spreads’ strike prices by the expiration date is attractively low. But it’s not that simple. Lower volatility in an option is usually accompanied by a lower premium – and net premium collected when a credit spread is established is the only source of potential profit for the investor. It’s a delicate dance. We must balance the risk that the underlying will go the “wrong” way and drive the option toward or into in-the-money territory against acceptable reward. In short, do we collect enough net premium when we establish the credit spread or Iron Condor to make the risk – however small – worth taking? Although our MIM technique uses Delta rather than Implied Volatility as our required initial volatility screening component, we very much favor also considering Implied Volatility (IV). Implied Volatility (IV) can be particularly helpful when evaluated vs. Historical Volatility (HV). This comparison can provide a very useful measure for further narrowing down a list of “conforming” credit spreads, i.e those credit spreads that meet all the “The Monthly Income Machine” initial trade entry requirements. Comparing IV (current market sentiment) to HV (actual prior volatility) allows us to determine if the current IV is unusually high or low for the specified underlyings. Remember that Implied Volatility is the market’s collective estimate of future volatility and is quoted in percent terms. For example, if the Implied Volatility of the S&P 500 is 15%, it means that market participants believe that the S&P 500 index will move 15% – up and/or down – from the current levels on an annualized basis. There are several methods that we can use to determine if Implied Volatility is expensive or cheap. You can use a simple statistical technique for determining if the present gauge of IV is at the upper or lower end of a historical range. For example, the graph below shows a chart of the VIX volatility index. This is a very popular gauge of IV. The VIX represents the Implied Volatility of the “at-the- money” calls and puts of the S&P 500 for the nearby option. So, when the VIX is climbing, Implied Volatility is also climbing. 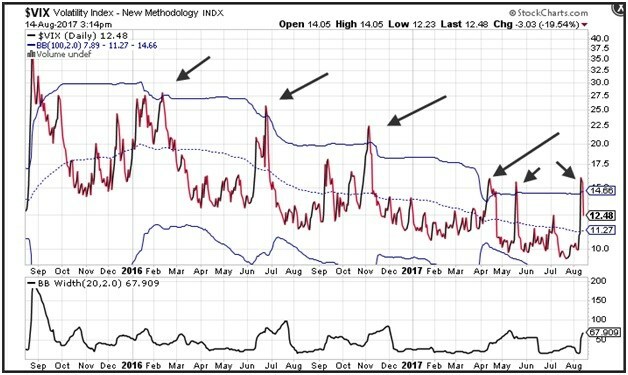 In addition to showing the value of the VIX, the chart shows the 100-day moving average and the Bollinger bands of the VIX. (The Bollinger bands are a statistical measure that represents a 2-standard deviation distribution above and below the 100-day moving average.) Many technicians use the Bollinger bands as a mean reversion tool, i.e to determine if a security has moved away from its average value too far too fast. The chart also shows black arrows where the VIX moved above the Bollinger band high, reflecting a period where the VIX was outside the 2-standard deviation range. Since this range represents 95% of all the data points over the past 100-days, we can considered them elevated, i.e. the VIX has stretched too far from a medium-term average. Now, that does not mean that the VIX can’t continue to move still higher. But it does say something about the current level being higher than the historical norm, which is generally an attractive level for “selling implied volatility,” i.e. for establishing a credit spread. The equation used to calculate Historical Volatility is the standard deviation of the price of the security, multiplied by the square root of time… but not to worry. Option-friendly brokerage firms provide the results of the Historic Volatility and the Implied Volatility calculations for you as part of their quote platform. In the SPY volatility chart below, the upper graph line is Implied Volatility (IV), and the lower one is the Historic Volatility (HV). Clearly investors are expecting more volatility than has been the recent case. Any option value is determined by the market, but you can also estimate the value of an option by using an option pricing model. As noted earlier, the most popular option pricing model is the Black-Scholes model. It not only describes the value of an option; it also provides for quantifying the risks associated with an option’s exposure to IV. Vega is the option Greek that describes that risk. Specifically, Vega estimates the amount that an option contract’s price will change in reaction to a 1% change in the Implied Volatility of the underlying stock, ETF, or Index. When a position is net short, like a credit spread, the Vega of the position is net negative. Since a credit spread is a net short position and has negative net Vega, the position decreases in value when the underlying asset’s volatility increases. Conversely, it increases in value when the underlying asset’s volatility decreases. Remember that with a credit spread, we want the value (net premium) of the spread to decline, ideally all the way to zero. An investor opens a call credit spread position in underlying XYZ when the underlying XYZ volatility is 30%. If the net Vega of the credit spread position starts out at -0.21, and XYZ’s volatility increases 1% to 31%, the credit spread would be expected to lose $21.00 for that one point increase in volatility ( 0.21*100 = $21.00). Why do we care about Implied Volatility and Vega? We care because once we have established an option credit spread, we have risk exposure to Implied Volatility rising. As noted, when you sell an out-of-the-money credit spread (which is what you will be doing), you want the premiums on your options to melt away to zero, not rise further. Even if the price of the underlying security remains unchanged, if Implied Volatility increases, the option premiums can rise. Rising premium values for a credit spread is exactly what you don’t want! The investor with an existing credit spread much prefers stable or falling IV, both in the absolute and relative to HV, because those conditions favor his credit spread’s net premium getting smaller as desired. Conversely, when he is entering his credit position, an elevated IV is good for him because it means higher premiums, and he is collecting those premiums when he initially establishes (sells) his credit spread. Option volatility is a critical component for evaluating any option position, including identifying the most attractive credit spread candidates for generating income. Four readily available values that assist us in evaluating and managing credit spread volatility are: Implied Volatility (IV), Historic Volatility (HV), Delta, and Vega. Implied Volatility (IV) provides us with a measure of an underlying asset’s expected future volatility. When elevated, it means we can expect greater net premium income for our credit spread when it is established, but also means we should expect greater swings in price. Historic Volatility (HV) gives us a rear view mirror look at the underlying’s volatility in the past. When IV exceeds HV, the options may be considered relatively “expensive” and vice versa. The Delta value is also a measure of volatility. It enables us to estimate the likelihood of the underlying reaching our credit spread’s short strike price at expiration, i.e. forcing our credit spread to at-the-money or in-the-money status against our wishes. Delta does so by giving us an estimate of what each dollar move in the underlying will do to the premium value of our credit spread. Greater volatility, whether measured by Delta or by IV, also means greater risk that an unfavorable move in the underlying’s price will threaten an already established credit spread with increasing net premium. Over-simplifying it, think of it this way: elevated volatility – whether using IV or Delta measurement – works for your credit spread at the time of inception by providing you with larger net premium income. But it works against you once you are in the spread because after the spread is established, you want the net premiums to decline… ideally to zero at option expiration. Neither volatility nor any other characteristic of options represents a single magic variable that will tell us which credit spread candidates deserve our investment, and which credit spread should be avoided. Whether you use “The Monthly Income Machine” (MIM) technique for identifying and managing the highest reward-to-risk credit spread and Iron Condor candidates, or employ your own arsenal of screening criteria, always remember that you are dealing with inter-related considerations. A conservative income investor who is seriously targeting an ongoing income stream from credit spreads needs an objective method of weighing a number of trade entry criteria that affect each other. and setting a risk limit for each trade. As with any market-related investment, the option credit spread investor needs to “manage” his credit spread position. The essence of trade management is risk management, i.e. what is to be done – and when – if an existing position is going the wrong way. While a discussion of risk management techniques is beyond the scope of this white paper, changes in the volatility measures IV, Delta, and Vega can play an important role in risk management decisions. Bottom line, option credit spread volatility is at the heart of both identifying the most promising credit spread candidates, and managing the positions once established.